I'm a bit late on the monthly favourites post this time around, but I figured I would still put my two-cents in before it gets any later. 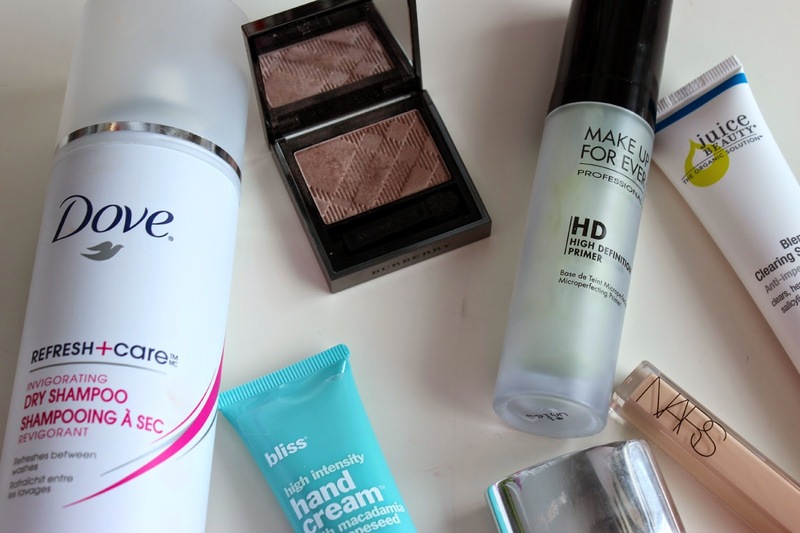 I wasn't necessarily in love with anything this month, but I had some products that I used non-stop. 1. Acne Treatments: If you follow me on Instagram, you would have noticed that I have been complaining about my complexion lately. I've been dealing on and off with acne since I hit puberty many moons ago, and by the time I graduated high school it was almost completely under control. But over the last few years, and especially in the last few months, my skin has been an absolute nightmare. I'm talking about teenage boy level cystic acne. Ugh. It's calmed down to a degree (my current cold and compromised immune system isn't helping matters much), but I think that the Juice Beauty Blemish Clearing range has done a good deal to help. The kit comes with a cleanser (which smells strongly of rotten apples and feet--not appealing [pun intended]), a serum, a moisturizer (which I really hate), a green apple face peel (my favourite of the group), and a face cloth. I'm not a fan of the consistency or the smell of any of the products, but I did notice an improvement in the size and frequency of my lovely bumps. I've been combining it with the Origins Spot Remover as well on all my active spots. I used it back in the summer, and found it way too strong on my then sensitive skin, but I haven't had any reaction to it this time. 2. 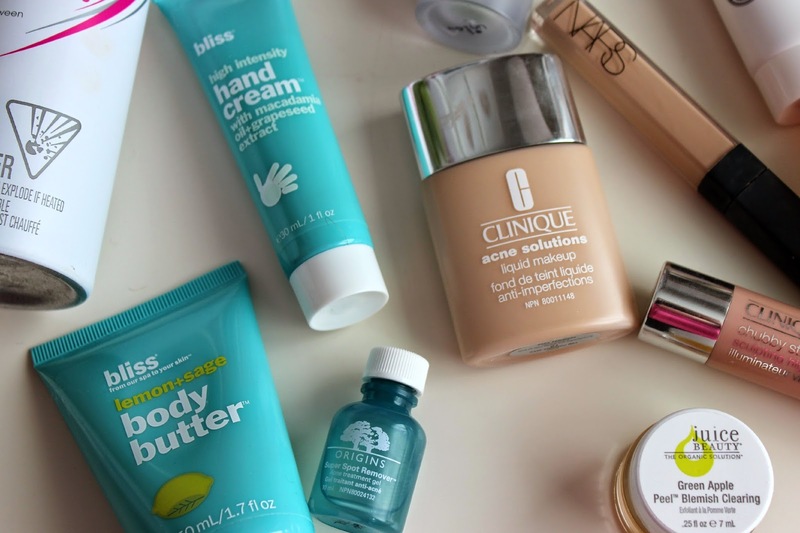 Hand and Body creams: I generally don't suffer with dry skin, even in the winter. But throughout January I had horrible eczema, something I've never had before. I tried a handful of eczema products and nothing was working. I finally went back to the Bliss Hand Cream pack from my stocking stuffer, and within a few days, my hands were completely back to normal. It was like magic. Even my dads perpetually dry and cracked hands looked years younger after a single application. It's thick and expensive, but a little goes a long way. And it smells ah-maz-ing. Total plus. 3. Hair: I've been really lazy with my hair lately, often just throwing it up into buns or french braids. I finally learned how to curl my hair with a straightener (thanks to Viviannadoesmakeup), and I've been doing that a bit too. I'm lucky in that my hair holds a curl for days, so I've been reaching for the Dove Dry Shampoo on my second-day hair. It's a really light-weight clear formula that doesn't leave you hair feeling sticky or looking white. Love this! 4. 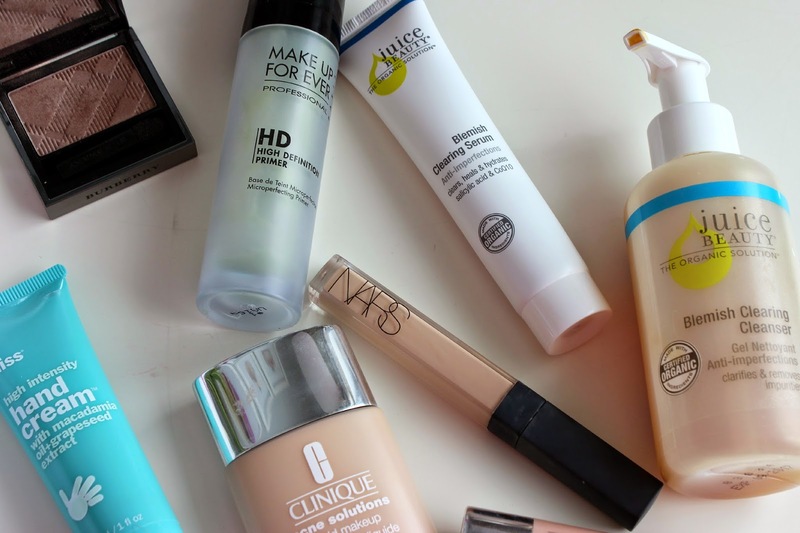 Makeup: I've also added the Clinique Acne Solutions Foundation to my daily makeup routine. It feels really light weight on the skin, works amazingly with my oily skin (I can go about 6 hours without blotting, which is pretty much unheard of for me). It doesn't have the best coverage, so you will need a heafty duty concealer for those scars and spots, like the Nars radiant creamy concealer. I actually need a lighter colour in this (#palegirlproblems), but haven't been able to find it in stock recently. And for my perpetually red cheeks, and the super red spots I've been getting, I've been using my ever-handy Makeup Forever Green Primer (01). This is technically discontinued now, but there are a whole new bunch of primers on the line which look like virtually the same formula to this, but it a squeezy bottle. I know I did a post all about this eyeshadow a few weeks back, so I won't belabour the point here, but the Burberry Sheer Eyeshadow in Rosewood is absolutely amazing. I picked up Tea Rose and Trench, two very neutral shades that will be perfect for spring and summer as well. I'm so sad to hear they are discontinuing a lot of the sheer eyeshadows! And last but not least is the new Clinique Chubby stick Highlighters. The contour colour is all wrong for me (and lets be honest, I'm too damn lazy to contour). But this highlight is perfect. It's has a silverly undertone which works great on my pale skin. It's so subtle, but catches the light in a really pretty natural way. What were your favourite products for the month of February?